I designed a breakout board for the Sensirion SHT1x Humidity and Temperature Sensors. The SHT1x family of sensors can measure relative humidity, temperature Celsius and temperature Fahrenheit. My plans are to use the design for various heating and control projects such as a wireless thermostat, greenhouse controller and some environmental projects. 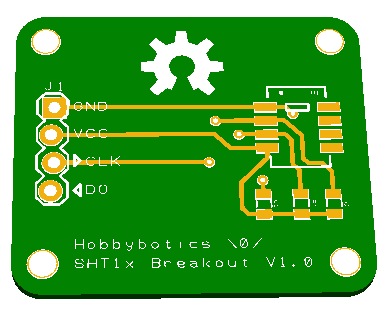 The project link details a SHT15 but, any of the sensors that share a common footprint can be used with the breakout board. I also developed (modified) an Arduino library for use with the Sensirion sensors. Check out the project here.